In 1875, Samuel E. Staples (1822-1902), a successful grocer and bookkeeper, invited four history devotees, Daniel Seagrave, Richard O’Flynn, John Smith, and Franklin Rice, to his home at 1 Lincoln Place in Worcester and “…proposed to form a Society for the purpose of increasing an interest in Archaeological Science, and to rescue from oblivion such historical matter as would otherwise be lost…” That meeting established the society that would become Worcester Historical Museum. Founded as the Worcester Society of Antiquity, the original group of four men grew, and by 1877 the Society was incorporated with thirty-seven charter members. The first headquarters were rented rooms in the Worcester National Bank Building at 11 Foster Street. 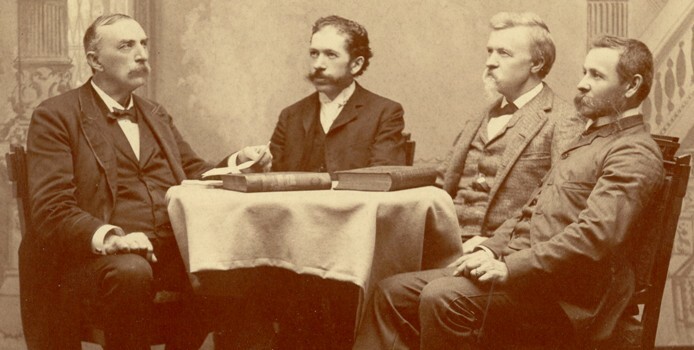 By the late 1880s, membership had grown to 160, the library boasted 18,000 titles, and they had assembled 3,000 as of yet unpublished pages of local history. With the addition of a large and important collection of books, manuscripts, broadsides, and maps from the library of Rev. George Allen, a reformer and political activist, it became clear the Society needed a larger home. October 1889, Stephen Salisbury III, a member and prominent Worcester businessman and philanthropist, donated the land at 39 Salisbury Street and $25,000 towards the construction of a new building. The Worcester Society of Antiquity’s new home, a Romanesque Revival-style brick structure, was formally opened on June 28, 1892, and remained the museum’s home for the next ninety-six years. In 1919, after years of “fitful and sometimes heated discussion,” the members voted to change their name to the Worcester Historical Society. In 1978, after another name change to Worcester Historical Museum, there was a major renovation to the building’s galleries, and a new emphasis on changing exhibitions. The museum’s mission, which had gradually become more focused, was now concentrated exclusively on Worcester history. In February 1988, after significant planning and fundraising, the museum moved to larger quarters at 30 Elm Street, in the heart of downtown. The elegant brick building, originally built for the Worcester County Horticultural Society, provided considerably more storage, office, and gallery spaces to support a greater range of programs. In September 2008, Worcester Historical Museum announced plans to move once again, this time from 30 Elm Street into the old Washburn-Moen factory building. Plans to move into the new location went awry when in 2010 the Washburn-Moen Factory went up in flames. The damage made the building structurally unsafe preventing the Museum from moving into its new home.